Emory students are invited to a panel later this month to hear how they can help the university and community reach the United Nations’ 2030 sustainability agenda. Slated for 7 p.m. to 9 p.m. on Friday, Nov. 17, in the Cox Hall Ballroom, the panel is free and open to the public. 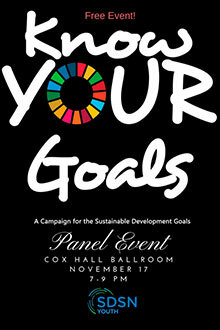 The #KnowYourGoals session is part of the U.N. Sustainable Development Solutions Network (SDSN) – Youth Initiative, a global effort to empower communities to raise awareness and work on the 17 sustainable development goals, such as clean water and economic growth. Emory College sophomore Sienna Nordquist has been appointed the Emory campus coordinator for SDSN-Youth and is organizing the event. Nordquist’s hope is to unite the campus and community about what action can be taken locally to achieve the international goals. “I am excited to bring together student and community leaders to discuss how sustainability challenges affect our Emory and Atlanta community, but also the solutions our youth have to offer,” says Nordquist, an Emory Scholar double majoring in international studies and economics.